Every night this week, I have dreamt I was on the beach. White sand, blue water, umbrella drink in my left hand and a tasty treat in my right. Instead, I’m stuck in humid DC and my day was the complete opposite of a vacation. I did laundry, went to the gym, dog park and grocery store. While I may not be hanging 10 or getting tan, who says I can’t eat like I’m on vacation? I had a piece of tilapia leftover from last night’s dinner so I decided to cook it tonight rather than freeze. I’m very glad with this decision because I whipped up some epic fish tacos. Who can resist a good fish taco? Light, crispy white fish, your favorite fresh veggies, warm torillas and a slather of yummy sauce. The great thing about fish tacos is that you can truly customize them and channel your inner creativity. You don’t have to stick with tilapia, either. 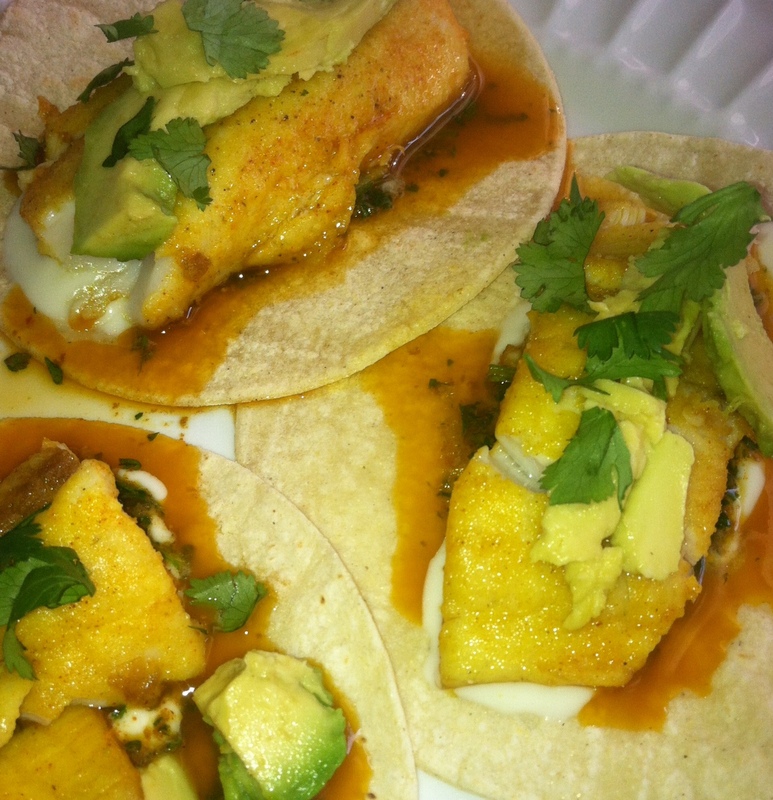 I like tilapia for tacos because it’s cheap, easy and very light– perfect for a PLRC like me. Feel free to try other fish such as halibut, mahi or grouper, though. Just make sure that it’s a firm enough to handle toppings and tortillas. For this recipe, I pretty much just used what I had on hand. I wanted to spice up the fish, so I dressed up the flour dredge with turmeric (hence the South Asian title), cayenne and paprika. Now for the sauce, which is more South American than South Asian, I made a delicious chimichurri sauce. This will stay fresh for up to a week in your fridge. I’m thinking it would be perfect on skirt steak. Or I might just need to make these tacos again later in the week. They are just that good. First, prepare the chimichurri. Blend all sauce ingredients in food processor until smooth. Place in container and refrigerate until ready to use. The sauce will stay fresh for up to a week if you keep it refrigerated. You can also freeze it! Mix flour, turmeric, cayenne pepper, paprika, salt and pepper. Rinse the tilapia filets and pat dry with paper towels. Season with salt and pepper then dredge in flour mixture. Heat skillet with 2 tbs olive oil. Fry the fish for 1.5 minutes on each side, then drain on paper towels. Try not to overcrowd the skillet, you can work in batches. As soon as fish comes off the skillet, season with salt and a little squeeze of lime. Heat the tortillas in the microwave then dress them. I put sour cream down first (1 tsp per tortilla), then chimichurri, then fish. Add a few slices of avocado and a sprinkle of cilantro. Enjoy! I plan to try this recipe this week! Sounds delicious! !